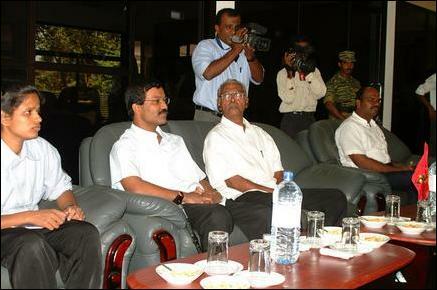 Mr. Akashi said that he and Mr. Thamilchelvan discussed the JVP-SLFP MoU but declined to disclose the details. 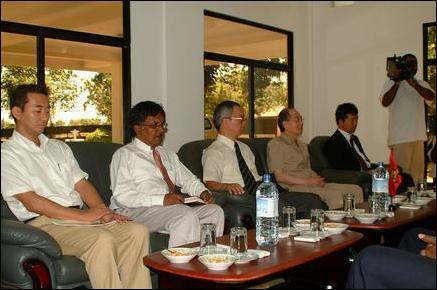 "We examined the present situation in Sri Lanka with particular emphasis on the rather disturbing political differences between two important leaders – the President and Prime Minister and the formation of the alliance between the SLFP and JVP – and how these developments would affect the peace process in the future," Mr. Akashi said. "I made a reference to Mr. Thamilchelvan’s speech on 19 January and told him that the international donor community is also worried about the situation in Colombo," Mr. Akashi added. He said that he reviewed with Mr. Thamilchelvan projects that Japan is implementing and plans to implement in the Northeast. 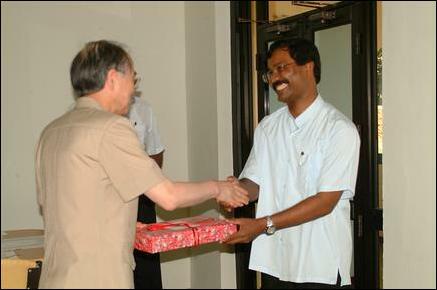 Mr. Akashi said he had urged Mr. Thamilchelvan to send an LTTE delegation to the donor conference in Colombo on Friday. "Mr. Thamilchelvan said LTTE should not participate in the conference in view of the confusing political situation in Colombo," he said.